Pack up the kids and grab the dog for an unforgettable camping weekend with family. This unit can comfortably sleep eight people, so invite the grandparents and the cousins! 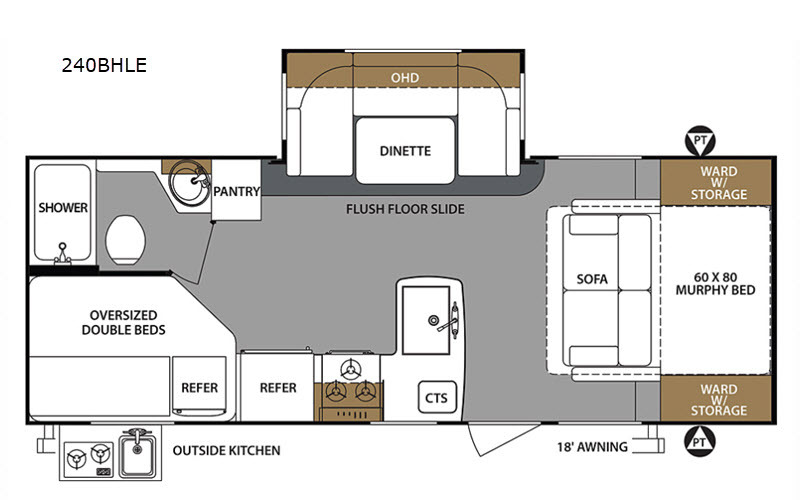 The U-shaped dinette within the flush floor slide is the perfect spot for the kids to enjoy their breakfast at, and getting ready for the day is a breeze with a full bath included in this travel trailer. The oversized double bunk beds are a great addition for the little ones and the Murphy bed at the front of the unit is both comfortable and functional because it can convert into a sofa for extra seating during the day. This model also features an outside kitchen that is perfect for cooking the catch of the day on! For any camping trip you will want a Forest River Surveyor travel trailer. 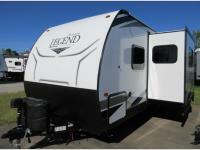 These models are lightweight and easy to tow, plus you will find that inside there is superior craftsmanship throughout. Along the interior there is a barreled ceiling which adds more headroom in each model and stainless steel appliances for an added at home feature. The designer Carefree flooring is stylish and easy to clean, plus there is a Furrion Bluetooth stereo for you to crank up the tunes. Along the exterior you will enjoy convenient features like the outside shower, the electric awning with LED lights, and the pet friendly utility hook with food bowls too. 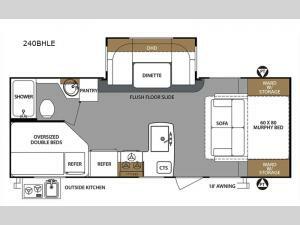 It is now easier than ever to choose a travel trailer that is ideal for you! What are you waiting for? 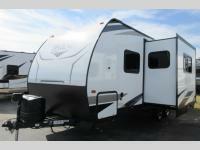 Come select your Surveyor travel trailer today!